Photo courtesy of Lord Mikus. By Baroness Katja Davidova Orlova Khazarina (Chis Adler-France). 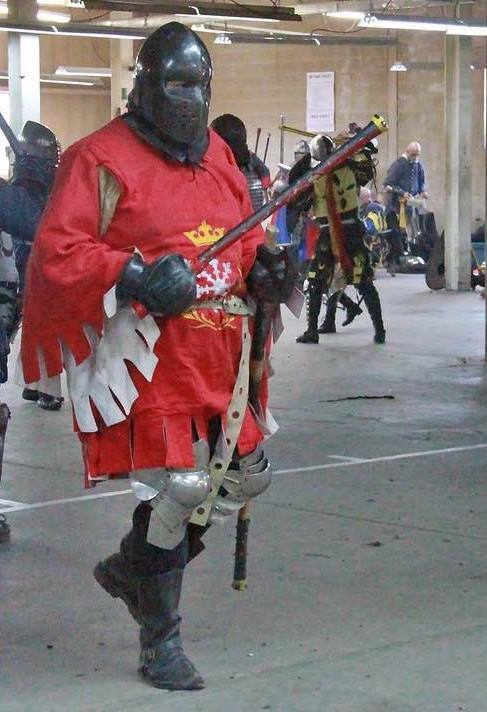 How do you top a fight practice that draws over 400 fighters and fencers from 12 kingdoms? You do it a year later, and this time draw over 500 from every single kingdom in the SCA except three (Avacal, Atenveldt, and Calontir). His Highness Timothy’s goal next year? To offer even more activities, draw more SCAdians, and completely fill the site! If you’re not martially inclined, you may be wondering just exactly what was that really huge martial practice in the Shire of Abhainn Ciach Ghlais that every fighter and fencer you know has been talking about for the past several weeks? Master Raeve teaches a rapier class. Photo by Baroness Katja. The practice took place at the Milton Shoe Factory, a cavernous three-floor building built in 1907 that boasts 14-foot-high ceilings. 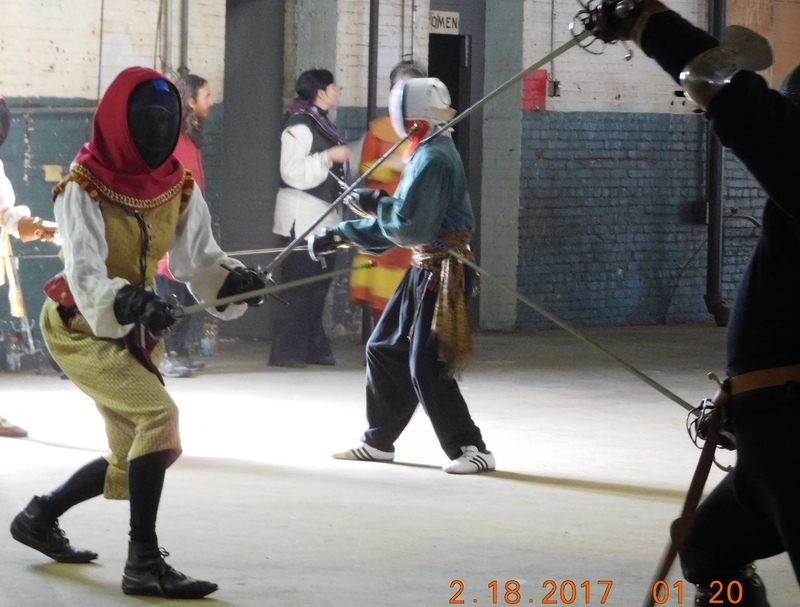 While both fighting and fencing last year were confined to the 120-foot by 300-foot second floor, this year fencing moved up to the third floor to give both activities more room. 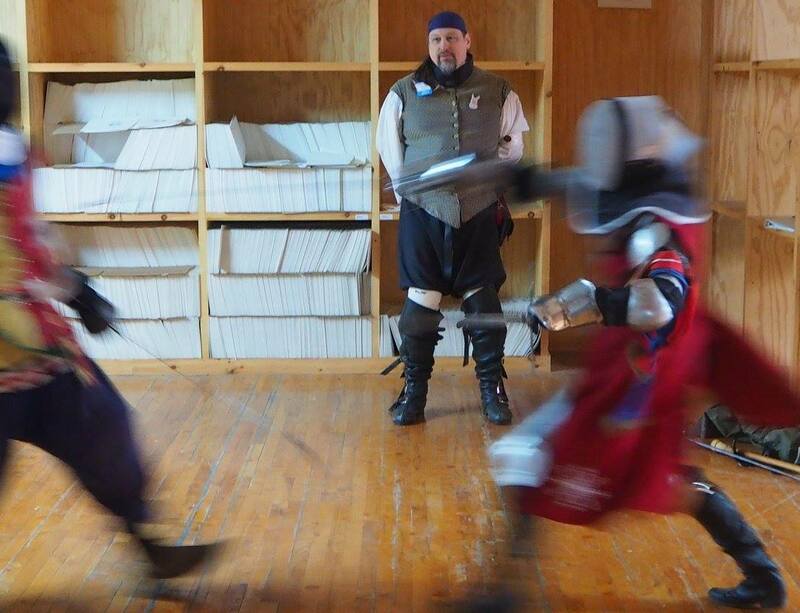 A last-minute addition, the Scribal Tour added a stop at the practice and offered a Visconti workshop on the third floor in a separate, fairly quiet but chilly area from the fencing classes and bouts. Q: Where did the name “Ædult Swim” come from? A: The name originated from my youth. We lived in an apartment complex as a kid, and the community pool had a 15-minute period every hour where the adults got to use the pool. For whatever reason, this seemed like a good name, even though in hindsight I think it might discourage the very people I most want to benefit from the event. Q: What inspired you to create this practice/event? A: When I moved to Æthelmearc, I found there was a disconnect between many of the isolated pockets of newer fighters and the more-experienced fighters. Neither group really seemed willing to travel to meet with the other. It is a cultural thing in this geographic area that I still don’t understand. I spent a couple months traveling to far-flung practices to work with folks and rapidly realized that there were far more people than I could possibly adequately work with. Duke Malcolm thanks his opponent after an energetic bout. Photo by Baroness Katja. I talked to a bunch of friends in the Chivalry and tried to get them to come out and help teach. We had a BBQ/practice in ACG in April 2013. With a few weeks’ notice, and with the promise of a dozen or so Chiv willing to work with folks, we ended up with about 75 heavies, 14 of whom were Chivalry as I recall. We kept doing regional musters during our last reign, with much the same response. Those less-experienced fighters who wanted to learn, traveled. I remember folks from Morgantown, VA coming all the way to Syracuse to a regional on a Sunday during a snowstorm. Countess Ariella faces an opponent on the rapier floor. Photo by Baroness Katja. The global nature of Ædult Swim was a direct response to actions that happened between the East and Middle Kingdoms a few years back. The animosity between the East and Middle monarchs, and by extension their Chivalry, had gotten so bad that quite literally the two monarchs had one of their knights (who is mundanely an arbiter) host a joint Chivalry meeting to discuss their issues. One of the things suggested (by Duke, now King) Edmund of the Middle was that an annual joint East/Middle fight practice would help us get past decades of animosity. Duke Eliahu ben Itzhak and I were invited as former East and Middle monarchs in the hopes that we could help moderate. Once this item was put on the table, I realized how perfectly located my shire was as a half-way point between the two kingdoms. King Marcus strides out onto the floor to play. Photo by Lord Sa’d al’Nizari. Q: What was involved in getting people to come to the first Ædult Swim? I recall you mentioning it at the end of a couple of your Courts last fall and winter. A: I spent the six months prior to the event browbeating, cajoling, begging, and pleading folks to come. We caught lightning in a bottle when I had the good fortune to take a business trip to Dallas, and I managed to convince the then-King and Prince of Ansteorra to make the trip. Those two, Dukes Sven and Lochlen, were the tipping point. At that point, we were able to use the “all the cool kids are coming” marketing to get folks to come out. Dukes Sean and Timmur from Artemesia also agreed to come out, and that opened the floodgates. I had asked several members of the fencing community to set up the rapier half of it and they all dropped the ball. With about two or three weeks left, I asked Countess Elena d’Artois le Tailleur, who was amazing. She got all the folks she did with almost no notice, even though it was competing against a major event of interest to the Atlantian fencing community. I cannot possibly praise her efforts enough. Q: What did you want to do differently this year and what do you want to add next year? You had mentioned adding A&S classes in the various small rooms on the site. A: The first year had a stiff learning curve, as I hadn’t anticipated many issues that we had. First, pretty well everyone entered the door within a 15-minute span of time. (Editor’s note: the site stairwells are narrow, and the only elevator, a freight one, was not available.) The line at troll was atrocious. We had six or eight folks at Troll and it was still a disaster. We got around that by asking for donations to pay for the site. Once our exchequer told me we would be able to ignore the nonmember surcharge/membership discount (this year), it only made it that sweeter. 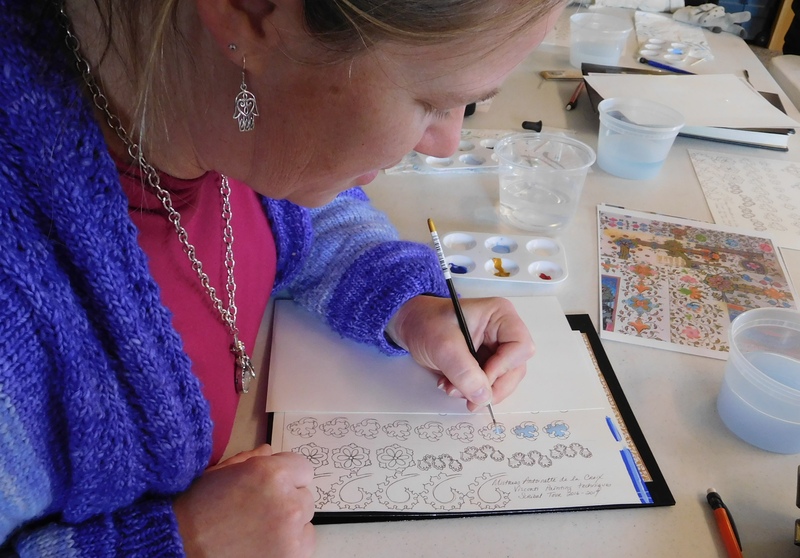 A scribe enjoying the Visconti workshop. Photo by Baroness Katja. The next part of our learning curve was the Saturday evening dinner. (Editor: After the practice each year, over 200 SCAdians enjoyed a post revel-type meal at the nearby Hotel Edison. See cake story here.) I spent half my time, and Lady Greer Wallace from ACG spent all her time, on Saturday collecting money from folks and tracking them down. THL Ariadne Flaxenhair of Dragon’s End and Sir Cunen Beornhelm set it up as a web-based document this year, which eliminated 90% of that chaos. As for next year, I am hoping to move it back a couple months into the late April to early June timeframe and, with the help of Mistress Alicia Langland, greatly build on our arts offerings. If anyone wants this in your event rotation next year, please private message me typical dates in your late spring calendar that I need to avoid. Also PM me the contact info for your kingdom calendar officer, so we can get it up early and block of dates. (The event) has grown beyond my very limited organizational skills, and next year we will have a new autocrat, Lord Leo Dietrich. He and his staff are already planning next year. Mistress Alicia spent her Saturday this year wandering around planning where we can put more artisans next year. It should be a blast! Q: The first Ædult Swim had a number of fighting classes announced beforehand and a few fencing ones. 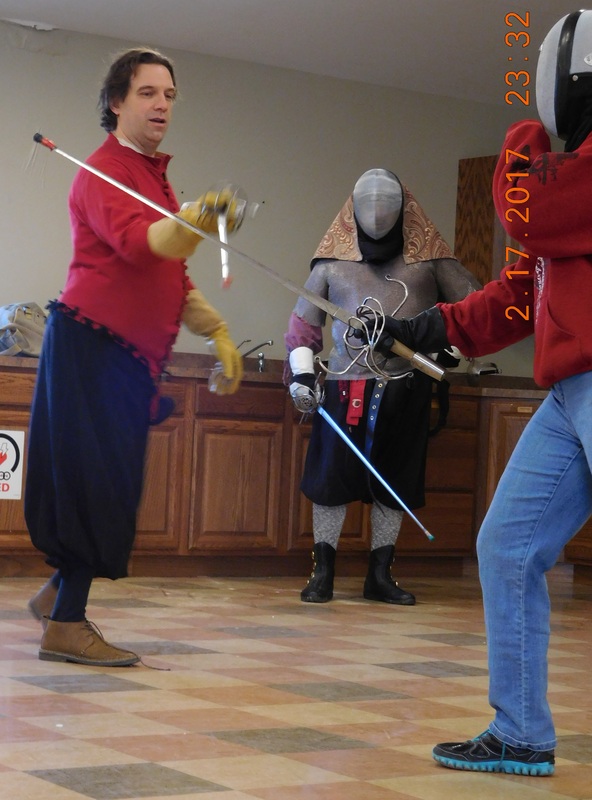 This year, there was a full roster of fencing and cut-and-thrust classes, but no formal fighting ones announced beforehand. Why? Baron Eric Grenier de laBarre watches a cut & thrust authorization. Photo by Lord Mikus. A: We had a side room on the main fighting floor where we did have some small, structured classes ongoing this year, but not as many as we did at Æ Swim I. The heavy classes will be much more formal next year. I found the informal nature didn’t work out this year. Q: What kind of specific heavy classes do you want for next year? A: It’s more of what classes do folks want. I had about 35 or 40 requests to teach last year and I told people (this year) to just announce them and folks would come. But it was too damn loud in the heavy section. Interestingly enough, at the first one, we actually considered the playing of music a la “Knights Tale” during the practice. I am so glad we didn’t, I had no idea how bad the acoustics were! Q: Besides those gentles you already mentioned, who else do you want to thank for their help with this event? A: There are so many people to thank I am certain I will be missing some. Without doubt, this could not have happened without the support of Gabrielle. Every time I get an idea, she lets me run with it, knowing folks will have fun, even though most times it throws our family in chaos for the week or so immediately before and during the event. When you see her next, please say thanks. 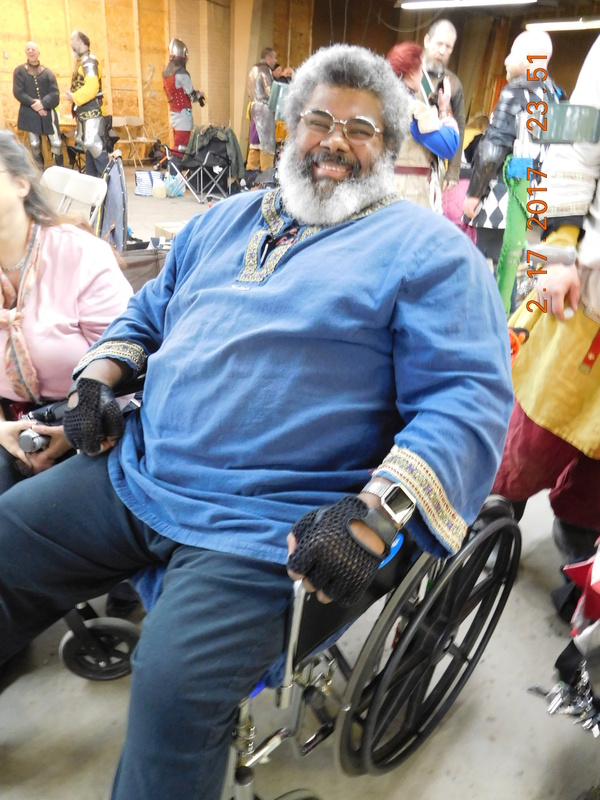 Sir Diablu happily greeted many friends at the event. Photo by Baroness Katja. THL Alianora Bronhulle and Baron Ichijo Honen, you greatly exceeded my very high expectations for the dessert. It really was the crown jewel in what was a spectacular weekend. Mistress Antoinette de la Croix, your scribal workshop was a nice touch of arts to a weekend of carnage. Thank you. Tommaso, for your kindness and generosity, thank you. Meghan Beck for providing two venues that made all this possible, thank you. Megan and most of all, next years autocrat, Leo, thank you for covering for my complete lack of any appreciable organizational skills. My usual stalwart crew of enablers, Silvester Burchardt, Ron Cudworth, Austin Smith, Lou McBride, and Elena de la Palma. Also thanks to Mistress Fredeburg von Katzenellenbogen, who carved a block print that went out to those who donated. It is stunning. When I can breathe, I am sending mine out to be framed. Thank you for all the help. I love our society. To see many of the uploaded videos and photos shared from this year’s event, see the Facebook event group here.